If you have been using official Google Adsense App on your iPhone, then you might have noticed that it has already stopped working. The Adsense App started crashing after you updated your iOS software to latest version, that’s is iOS 7.0.3. I’m not sure about iPad, but this app no longer working in iPhone. What actually happening is, when you tried to launch the the official Adsense app in iOS 7.0.3 it will soon closes the app instead of opening. Many users started posting reviews on App Store regarding crashing problem, but still Google has not updated their app. My primary method of checking adsense revenue is through iPhone app. But it all of a sudden stopped working. So here I found some alternative to official google adsense app. QuickAdsense App comes for both iPhone and iPad. 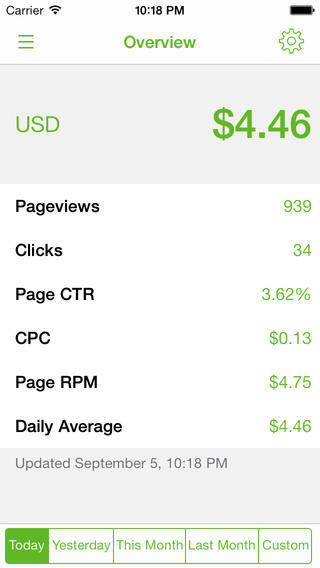 Currently I have been using this app to check my adsense earning on my iPhone. This is a free app, comes with nice features. It also have in-app purchase option if need more options. But free app is sufficient for checking your adsense revenue. Currently I tried only this app which is working without any problem. I recommend everyone to try this app before trying any other adsense app. Because as of my knowledge some of the adsense app won’t work if you enabled 2 step verification for your Google account, but this app supports. QuickAdsense uses OAuth to authenticate with Google Adsense in a secure way. If you interested to try other than this app, then you can try these adsense apps.